Cycle to the park, drink some beer, throw some wood around – and do it all in style. Spring has sprung, and with that comes picnic season. Time to take on the great outdoors and try on some new trends. Lumbürr Co crafted up the Lumbürr Bicycle, infusing Canadiana & Swede to create a unique experience and a quality product. The bike itself consists of a raw-finish steel frame (by Gallant Bicycles), custom hand-carved antler handlebars (found, naturally shed) and a Brooks canvas and rubber saddle. "Lumbürr Co came about as a result of the two years I spent in Sweden doing a master's in sustainable design. While over there, I had a ridiculously good time playing kubb during a swedish midsummer party. I wanted to capture a little bit of that and bring it back to North America." The accessories complement the natural materials and craftsmanship vibe of the bike. 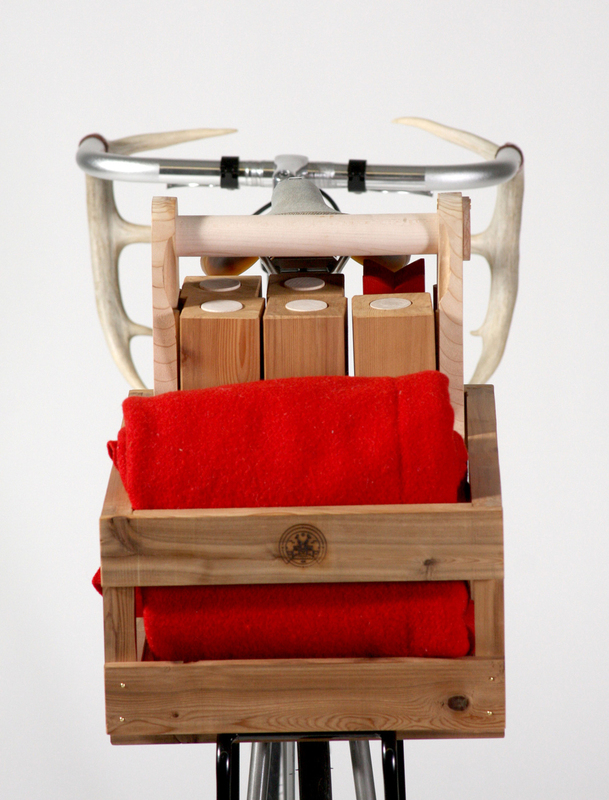 The Six-Pack-O-Kubb is a re-design of the Swedish classic. “Kubb” is a game that basically involves throwing small pieces of wood at other small pieces of wood. It’s easy, it’s summery, it’s a little aggressive: we like it. Plus it all fits in stylish cedar case that doubles as a beer carrier (hence the name) which sits like an obedient terrier in a matching cedar crate. Throw in a wool blanket on the attached carrier and you’ve got yourself a perfect day at the park. The sets are all handmade from locally sourced cedar, pine and oak by a group of retired woodworkers in Sudbury, Ontario, Canada. The raw materials are left unfinished so they age like fine wine, each changing with the different elements it encounters throughout its life, reflecting the times well spent with the owner, the cyclist, the wood flinging beer-drinker. Lumburr began this project to create products that promote well-being from their inception to the day they die, defying the modern day reliance on man-made materials and mass-production. The simplicity, care, and consideration of the life-cycle of a natural product culminate in this beautiful sequence of products that make us want to saddle up, crack a cold one, and enjoy a deep breath of fresh air.